Quantum physics: the wave function is spread out over the Compton wave length (lc = h/mc). t. lc = h/mc. One observer’s electron is the other observer’s positron . The presence of antiparticles is necessary to restore the causal structure to the process seen in another inertial system. According to Quantum Mechanics, the more precisely the position of a particle is determined, the less precisely its momentum – a quantity related to its velocity and mass – can be known, and vice versa. This phenomenon is known as the Heisenberg’s uncertainty principle. Another aspect of the Heisenberg uncertainty principle is that the energy can fluctuate over a small interval of time. These fluctuations may involve violations of the universal speed limit (Special Relativity Theory). Heisenberg uncertainty principle is one of the areas of tension between the Quantum Mechanics and the Special Relativity Theory. QFT (Quantum Field Theory) avoids tension by getting rid of the concept of a moving particle. In QFT particles don’t move, they are created or destroyed by the all-pervading field. You might argue that the particle trajectory concept is already eliminated in Quantum Mechanics but QFT does a more careful job. Interestingly, in particle accelerators known as storage rings, we observe individual electrons moving in orbits (well defined trajectories) for hours. QFT remains silent about that 🙂 Clearly, QFT is an abstraction. QFT is more relevant when elementary particles are interacting over very short distances. 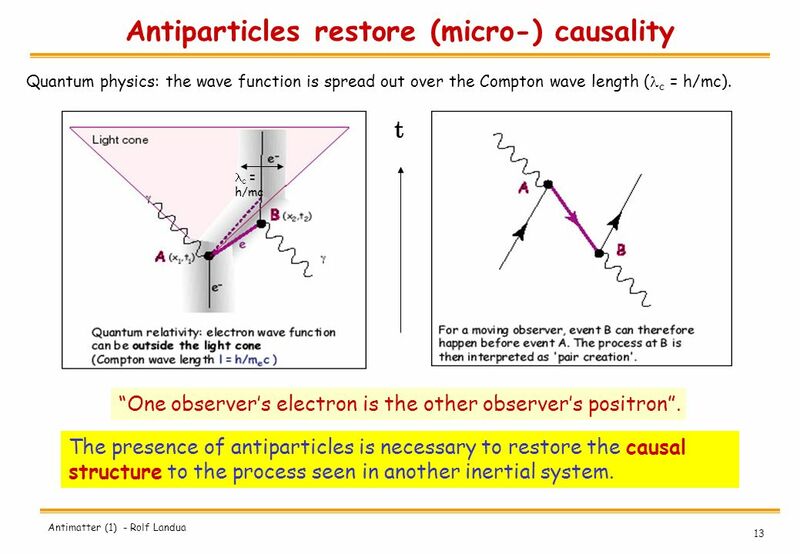 When we deal with free electrons coasting in the universe QFT only worries about the interaction of the free electron with vacuum fluctuations and also with the photons it emits. As a theoretical exercise, QFT has to make sure that a distant charged particle or a distant electromagnetic potential does not influence the behavior of the electron in question especially when the distance is “spacelike.” The term “spacelike” means that the distant entity is beyond the light cone so that there is no possibility of physical influence. QFT has to have mathematical characteristics to prevent interactions over spacelike distances. This requirement is known as the microcausality condition of QFT. It turns out that the microcausality requirement can only be satisfied if the electron creation process involves the creation of the anti-electron (positron) as well. Indeed, electrons and anti-electrons are always created in pairs. We see this in modern particle colliders. Therefore, in the beginning of the Big Bang, equal number of electrons and anti-electrons must have been created but somehow most of anti-electrons disappeared from our part of the universe. Thank God! Otherwise we would not be here. We still observe anti-electrons (positrons) in cosmic rays and we can create them in particle accelerators, of course. Natural decay processes also create positrons (bananas emit positrons) but still there is a huge imbalance of matter over anti-matter. The mystery of this imbalance in the current universe has not been solved yet. Sorry, I digressed. Back to microcausality! I mentioned earlier that QFT is more relevant when elementary particles interact over very short distances. Can these short distances be spacelike? In principle, yes. Does QFT have to have a requirement that the universal speed limit still applies even for the microscopic distances? I can’t find any good answers from the experts! Experimental verifications of microcausality are lacking too. I can’t even point you to a reference. That’s where we are on microcausality. Question remains: are classical concepts like space and time and associated principles like the universal speed limit valid concepts over microscopic distances? This entry was posted in physics and tagged Microcausality, Quantum field theory. Bookmark the permalink.